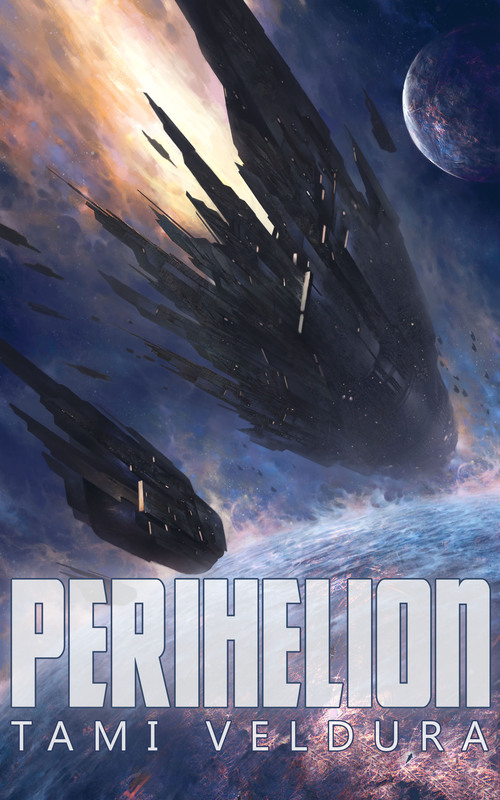 An arti­fi­cial gen­er­a­tion-ship awak­ens in Perihelion, a tense sci­ence fic­tion adven­ture that ques­tions humanity’s role as future-gods. In a fam­i­ly-dom­i­nat­ed space­far­ing future, Queenships are the def­i­n­i­tion of pow­er. All mil­i­tary, eco­nom­ic, and polit­i­cal maneu­vers occur with these pin­na­cles of tech­nol­o­gy. Secrecy is the cur­ren­cy of the realm. But in a world where Queenships are born, not built, keep­ing secrets is tricky busi­ness. In a dis­tant sys­tem, one fam­i­ly is deter­mined to re-dis­cov­er the trick that awak­ened the orig­i­nal Queenship, while in anoth­er, a new­ly born Queenship selects a pilot with ties to two oppos­ing fam­i­lies. They’ll do any­thing to keep their secrets from each oth­er, and win the ship to their side. But the only way for three to keep a secret, is if two of them are dead.